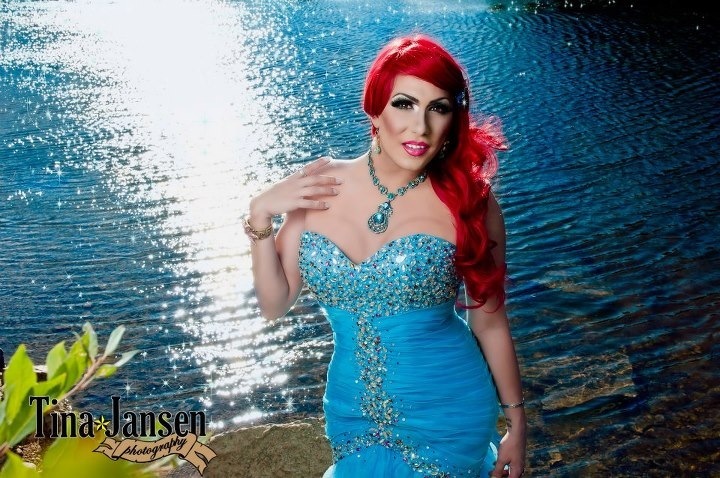 So a few months ago I received a gorgeous email from one Kerry Dale, a beautiful drag performer and artist from Winnipeg, Canada, who’s loved mermaids since he was a child and now does a popular Little Mermaid drag act (as Satina Loren). I knew I was different from an early age. I fell deeply in love with Ariel, the Little Mermaid, the first time I saw her. Her hair, her tail, the underwater realm… They enthralled me. My mother and her friends thought it was cute that I was in love with a mermaid. I wasn’t: I wanted to BE her. I wanted to live in Atlantica, swim with the fish, and someday fall in love with a Prince. Yeah, a prince. Growing up I didn’t know what ‘gay’ was, but I sure was it. The teasing got to me, but I never let it show. My brothers, one older and one younger, had to be stronger, because they were also poked at for having a sissy brother. My solace, my coping mechanism was art, and reading. Once Upon A Time… is probably the most comforting sentence anyone could ever tell me. When I was troubled I used to delve into stories about pumpkins and glass slippers; of mermaids and sea witches; of true love and the magic it contained. I read of far off places and imagined my life there. Seven dwarves to keep me company. Wicked stepmothers and dragons to conquer. When I was done I would pick up a pencil and draw until I couldn’t. Fairy tales have been my escape. They helped me when my parents divorced. 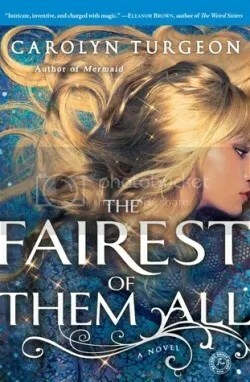 The familiar stories gave me a sense of clarity, that everything has a Happily Ever After. Finishing high school, I knew that being gay was what I was, and I needed a way to convey my talents in a different way, and I got into drag. And now, in the clubs, I do ‘Disney Drag,’ where I get to channel my creativity by breathing life into the characters from the stories I had read. I love this, how someone like Kerry is able to draw strength and inspiration from fairy tales and mermaids and use them to infuse his own life with magic and beauty. I also think it makes perfect sense that a mermaid, in her perpetual state of transformation, would be a powerful symbol for someone coming to terms with his/her sexuality—and then embracing it. Aren’t those gorgeous? I think we should all fly to Winnipeg immediately to see some awesome Little Mermaid drag. In the meantime, though, I asked Kerry a few more scintillating questions. 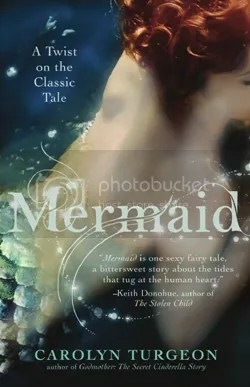 So what do mermaids and fairy tales mean to you? Fairy tales have always been a part of my life as long as I can remember. My mom watched Disney movies all the time with me and my brothers since we were kids. I always loved reading about faraway magical lands and stories of love conquering all, Good VS evil. Fairy tales instilled in me a never-ending sense of optimism: I feel now if I remain positive, regardless what obstacles I’m facing, I’ll get my own Happily Ever After. Why do you love mermaids? I can’t honestly say why I love them. They’ve always been a part of my life. Since kindergarten I had a fascination with them; I was either reading Hans Christian Andersen’s tale, the Disney version, or I scoured our local libraries to find other stories about them. I think their sense of wonderment was what drew me to them: these beautiful and dangerous beings that experienced life in such a different way. It made me want to know about them. Can you tell me about performing as a mermaid? I’m a Drag Queen here in Winnipeg, and I’m most known for my Disney/Fairytale looks, and most known for my Little Mermaid impersonation. I usually style my wigs to resemble her and then I dress like she would (I imagined if she was a real girl she would wear greens and blues) and I even have a mermaid costume I occasionally wear. I know you’re familiar with Hans Christian Andersen’s story and his little mermaid. Can you tell readers about that? Can you explain why/how both his story and the little mermaid resonate with you? According to what I’ve read, Andersen fell in love with women and with men throughout his life, and at one point he wrote The Little Mermaid after being rejected by Edvard Collin. At the time homosexuality was not an open topic and hardly discussed. The rejection and the feeling of being unwanted drove him to write the story of the little mermaid. The story resonates on multiple levels for me. I was terrified of actually coming out to my family, and I feared rejection. I knew since I was a kid that I was different, that I wasn’t like everyone else. While my brothers always had girlfriends, I didn’t. I think that the mermaid’s desire to be human mirrored my own feelings: I wanted to be something more than just a straight boy; I wanted to be different. I wanted to be me. But it took me a long time to come to terms with my sexuality and I finally told my family, and I was surprised that nearly all of them were accepting. Luckily for me I didn’t have to consult with a sea witch to do that! Do you love Disney films, too (and Ariel)? Disney is the reason why I got to love The Little Mermaid! It was the first movie I ever saw and it remains my favorite movie. I used to work at our local Disney store until it closed, and I got to Disney World with friends every year with friends. I love everything about Disney, as I have a large collection of Disney items … my room resembles Ariel’s grotto; I’ve got Disney stuff galore! As an artist I am also blown away by the art in the movies. The animation, colors and designs are incredible, especially in The Little Mermaid, Beauty and the Beast, and Sleeping Beauty, which are my favorites. Why do you think that mermaids, and fairy tales, are so popular right now? I think that everyone is already so familiar with the stories they grew up with, and that now that more people are writing their own versions or adapting them we want to create further connections with the characters we already know and love. How do people respond to your love for mermaids (or drag act, or mermaidliness generally)? Some think it’s weird that at the age of 22 I’m still watching Disney movies and collecting mermaid memorabilia; some don’t get it. I just can’t shake the feeling of wonderment and beauty I get when I read about them. Drag isn’t accepted by everyone, but nearly everyone I talk to loves what I do and appreciate I’m taking the fairy tales of our youth and reimagining them in a different light. No matter what, do what you need to do to make yourself happy. RuPaul says “What other people think of me is none of my business.” No matter what, BE YOU. DO YOU at 100 percent, always. Never let others dictate your decisions. Obviously take into consideration the wisdom of those that know what you’re wanting to do, but just remember to do what you need to to be happy, and your Happily Ever After will certainly come along!